Creating a new resume or editing your existing one probably isn’t at the top of your to-do list… or maybe it is and you continue to put it off. Unfortunately, delaying the process won’t make this dreaded task go away, as it is certainly not going to write itself. Which is why we’ve gone ahead and composed a cheat sheet that will make creating your resume a snap. Below you will find the top five ways to make your resume stand out among the others in the pile. So go ahead, break out your trusty laptop and get to typing– you’ll be finished before you know it with these quick tips. Objectives aren’t required, but if you choose to use one, begin with that. The next section to include would be your employment experience, as this is what employers will pay the most attention to. Follow up with your education, honors/ awards, professional affiliations, and conclude with any additional information such as skills and/or activities. Be very concise when constructing your resume. For your educational experience, all that needs to be included are simply the dates attended, the location, and your area of focus. The same rule applies for your employment experience and the other bullets you include. No need to go into depth about anything; the basics will do. One of the most important things to keep in mind when putting your resume together is organization. Some key methods of organizing your resume would be to make sure your activities are in reverse chronological order—meaning the most recent events should appear first. This rule stands because employers want to see the most relevant information first. Also, make sure you use the same font, font size, and characteristics (boldness, italics, etc. ), according to the headers and body text. This may seem like common sense, but especially if you’re copying and pasting information from other documents, it is sometimes easy to overlook. When it comes to resumes you can never be too neat and organized. Depending on the position you’re applying for, you’re going to want to highlight different aspects of your personal and professional experience. Are you looking for a job within a non-profit organization? If so, focus your resume on the experience gained in that specific field, such as volunteer work, past internships for non-profits, personality traits that would make you a good fit for that organization, etc. Or perhaps you’re applying to a job for a start-up company. In this case, highlight the parts of your experience in which you excelled at working in a similar type of environment. Mention experience supporting your ability to work independently and resourcefully and discuss your multitasking skills. Maybe you’re applying to both types of jobs, then I recommend saving various copies of your resume—one you would send to larger organizations, such as non-profits, and one you would send to the smaller, start-up companies. If you have more than two resumes, that’s fine—the more job-targeted the resume, the better. Employers want to see that you have experience similar to the services their offering, and if you’re resume highlights what they’re looking for, the more likely you are to get hired. Composing a resume as a recent graduate is different than composing a resume as a seasoned professional for the simple fact that you’re probably not going to have as much work experience compared to the latter. If you just graduated, your work experience will probably solely consist of a little diner job that paid your rent and a couple internships—and that’s OK. Highlight your main achievements and responsibilities from these positions, and then aim your focus at your educational experience. Include any additional noteworthy achievements as well as the professional affiliations you’re involved in as well. 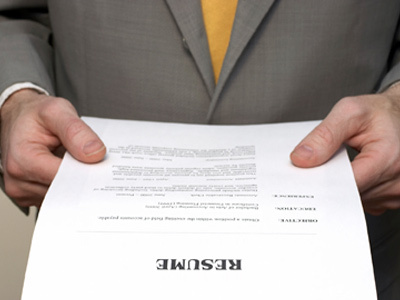 Hopefully these tips help you out when it comes to constructing your resume. Rather than looking at your resume as some huge task to complete and getting overwhelmed, go through this list and tackle each tip one at a time. This is a much less intimidating way to go about the process and will result in you finishing the task quicker and less stressed. Good luck and happy resume-writing!